See Trujillo’s most important archeological sites on one big day trip that includes temples from both the Moche and Chimú cultures. Start at the Temple of the Sun and Temple of the Moon, which together make up the site known as the Temples of Moche. Then see the Temple of the Dragon (aka Temple of the Rainbow), and visit the coastal town of Huanchaco for lunch. Finally, experience the biggest ancient city in South America — Chan Chan — a UNESCO World Heritage site. During it all, learn about the history and cultural significance of these sites from an experienced guide. Visit two Chimú archeological sites and the coastal village of Huanchaco on this combo tour from Trujillo with a knowledgeable guide. Start at the Temple of the Dragon (also known as the Temple of the Rainbow), an adobe pyramid that features beautiful frieze murals. 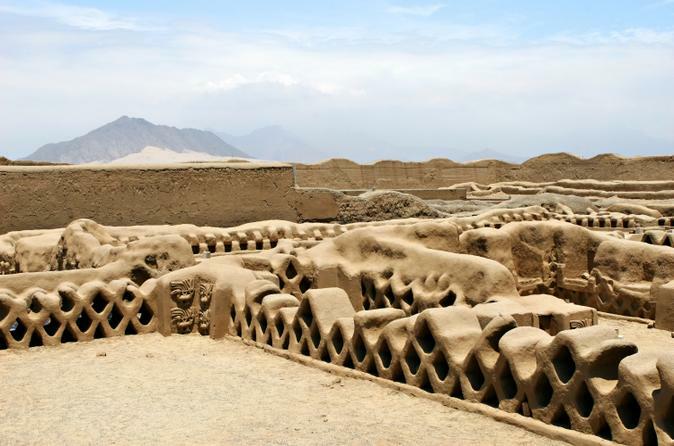 Then tour the biggest ancient city in South America, former Chimú capital and a UNESCO World Heritage site, Chan Chan. 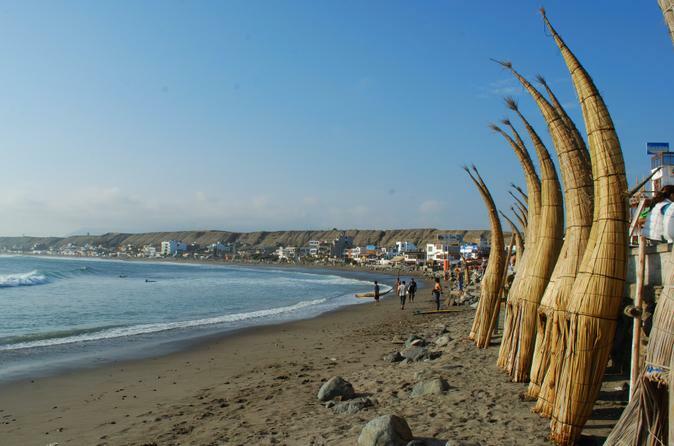 Explore its plazas and learn about its history, and then finish your tour in Huanchaco to see its famous reed fishing boats. Hotel transport is included. 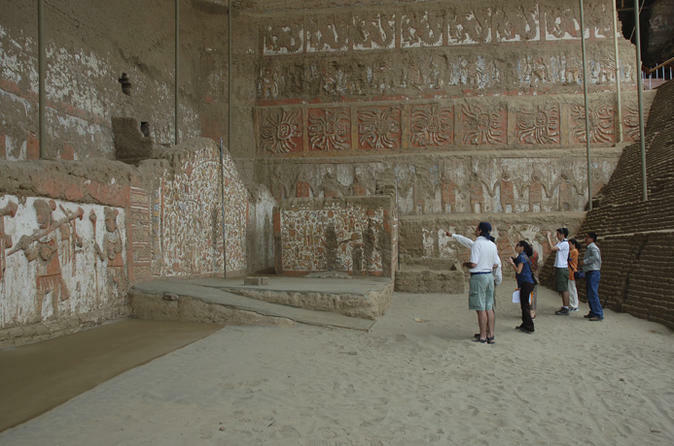 Take a private tour from Trujillo to El Brujo Archeological Complex with your own private guide, and enjoy a glimpse into the lives of the Moche civilization, who inhabited northern Peru from the 1st to 8th centuries. See El Brujo’s three main temples and learn about the role of each, and be wowed at the on-site museum that houses a female mummy recently discovered at the archeological site. This private tour provides a more personalized experience. 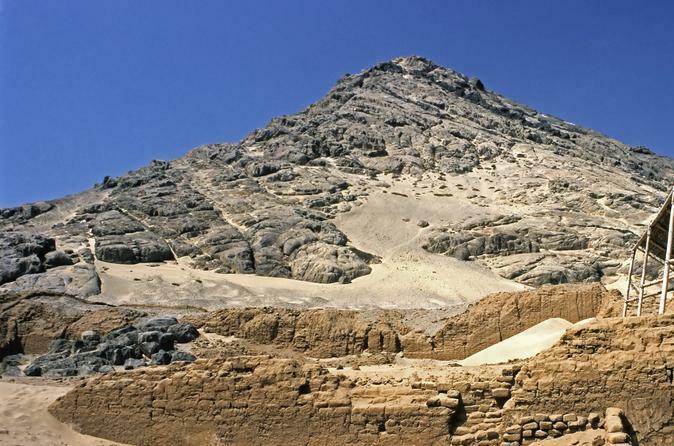 Visit two of northern Peru’s most important ancient temples on this tour from Trujillo to the Temple of the Sun (Huaca del Sol) and Temple of the Moon (Huaca de la Luna), which together make up the Huacas de Moche, aka Temples of Moche. With a knowledgeable guide, tour the site, staring in wonder at the size of the large temples and learning about their significance to the ancient Moche people. You’ll also see Moche artifacts at the onsite museum. Choose from a group tour or private tour. 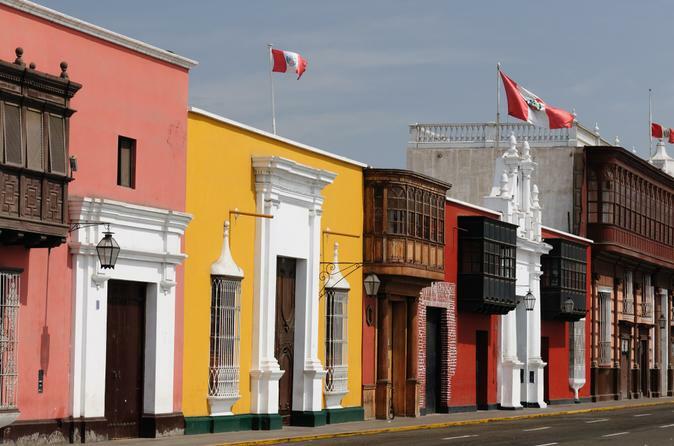 See Trujillo’s top sights and orient yourself to this historical city on a 3-hour sightseeing tour. 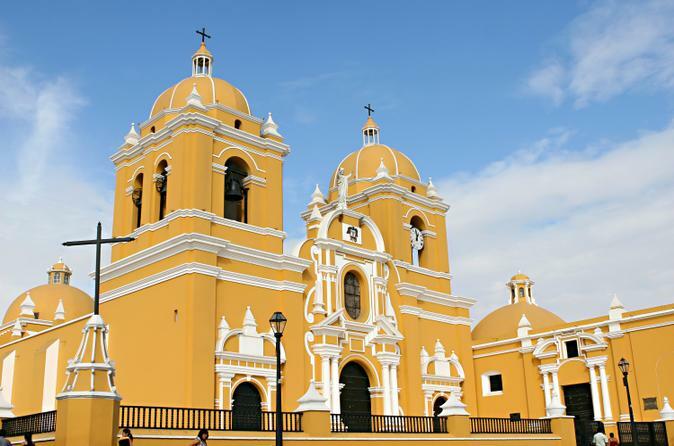 Visit the main square, Plaza de Armas, to see the Freedom Monument and the Trujillo Cathedral, and then take off around the city, passing by lovely colonial mansions, several churches including El Carmen Church and La Merced Church, and other attractions like Plazuela El Recreo. Plus, tour the National University of Trujillo Museum of Archeology, Anthropology and History with an experienced guide. Choose between a group and private tour. If you’re looking for the ultimate combination of Trujillo city sights and surrounding archeological attractions, this is it. In one activity- and history-filled day, take a private city tour to see attractions like the Urquiaga-Calonge House; tour the National University Museum of Archeology, Anthropology and History; visit the Temple of the Sun and Temple of the Moon; have lunch in the coastal village of Huanchaco; and explore the former Chimú capital of Chan Chan, a UNESCO World Heritage site. An experienced private guide and transport are included. 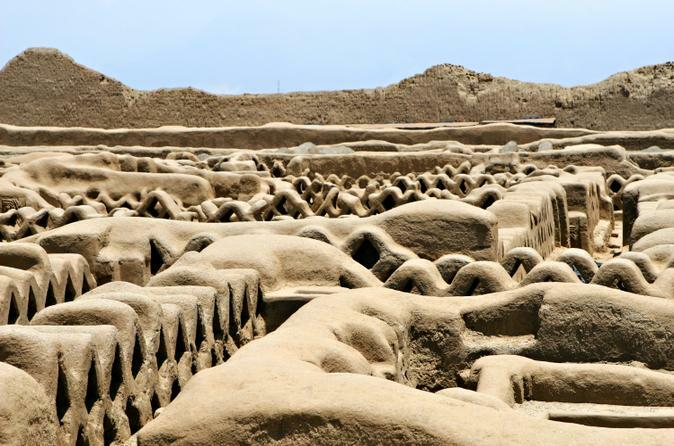 Discover the best of northern Peru’s archeological sites and museums on this 3-day tour of Chiclayo and Trujillo. Learn about pre-Incan cultures like the Moche, Sicán and Chimú, and marvel at ancient wonders like Huaca Rajada, the Temple of the Moon and Chan Chan — a UNESCO World Heritage site. See pyramids and mummies, visit the Lord of Sipán Royal Tombs Museum and Sicán National Museum, and admire hundreds of artifacts. Four classes of accommodation are available to suit your budget, and a local guide ensures you enjoy a fascinating experience.